On November 17, the Sensus Theater at the Citizens’ House and the Romantics Union in Stockholm paid tribute to our very own Nobel laureate poet Rabindranath Tagore through discussion and reading. I was invited to take part in the discussion and a reading of his poems in Bengali. The purpose of the initiators was to listen to the music of Tagore’s words in the original language alongside the Swedish translations. On the other hand, to mark the centenary of Tagore’s Nobel Prize, Smockadoll Publishing Company brought out a thick volume of his selected poems in a new translation done by poet Kristian Carlsson. The audience directed a good many questions at me, Kristian and the chair of the session poet Andreas Bjorsten. I was involved in this Tagore project, contributing the introductory essay. One question I faced was how Bangladesh perceived Rabindranath Tagore today. I replied that Rabindranath Tagore was the gateway to Bengali literature. For Bengali speaking people, he is all-in-one; from a philosopher to a social reformer, from a writer to the introducer of microcredit banking. He is our teacher. He is the identity of our culture. He is our second passport. Now let me look at what is happening in Dhaka, the capital of the Bengali speaking world. I was corresponding with fiction writer Moinul Ahsan Saber. I asked him whether he had left the weekly magazine ‘ Shaptahik 2000′. He told me the magazine had been shut down. What a pity! What can I say? The magazine was a sister concern of the English newspaper Daily Star, owned by Mediaworld Limited. 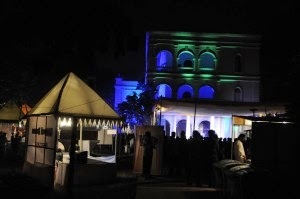 The same media group is a host of the so-called Hay Festival Dhaka. They cannot run a fine, popular and secular magazine like Shaptahik 2000, but they do not hesitate to import a colonial product like Hay Festival from Britain. This reminds me of a Bengali proverb, equivalent of the biblical saying, “each tree is known by its own fruit”. That’s all. Anyway, this media group has all the rights to fulfill its corporate greed. But why Bangla Academy? What did we learn from our teacher Rabindranath Tagore? If corporate power becomes the barometer for measuring literary talent or cultural tradition, an evil fate is awaiting the nation. When the city burns, the temple will not be spared. That’s our Bangla Academy today. If the academy chief Shamsuzzaman Khan does not realise this, is better for him to leave. It will rather help the academy to protect its dignity from this corporate embarrassment. Let me raise one question. Will the Swedish Academy in Stockholm, the Royal British Academy in London, the French Academy in Paris or the Sahitya Academy in New Delhi allow any corporate media group to host this Hay Festival on its premises? If not, why Bangla Academy? By allowing the Hay Festival to take place on the Bangla Academy premises, the authority has stigmatised a national institution, making it the ‘Hay Hay’ Bangla Academy. We must condemn this.